The Rasmus is a Finnish rock band that formed in 1994 in Helsinki while the band members were in upper comprehensive school. The original band members were Lauri Ylönen (lead singer/songwriter), Eero Heinonen (bass), Pauli Rantasalmi (guitar) and Jarno Lahti (drums). Jarno Lahti left the year after and was replaced by Janne Heiskanen in 1995. Heiskanen quit the band in 1998 and was soon replaced by Aki Hakala. The Rasmus has sold 5 million albums worldwide, 310,000 copies in their native Finland alone. They have won numerous awards, both domestic and international. Lauri Ylönen is a Finnish singer-songwriter, best known as the frontman of the Finnish alternative rock band The Rasmus. "October & April" is a song by the Finnish rock band The Rasmus, featuring Anette Olzon from Nightwish. Peep is the debut album by Finnish alternative rock band The Rasmus, released on 23 September 1996 on Warner Music Finland. Lauttasaari is an island in Helsinki, about 5 km west of the city centre. Together with some surrounding unpopulated small islands, Lauttasaari is also a district of Helsinki. 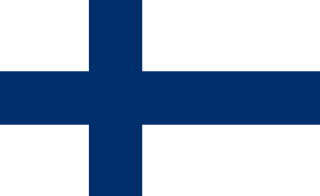 With 23,226 residents as of 2017, the island is Finland's second largest by population, after Fasta Åland. Its land area is 3.85 km2. Dead Letters is the fifth album by Finnish alternative rock band The Rasmus released in 2003. It was released later in 2004 in the US, UK and Australia. Their previous album, Into, had seen some success in some parts of Europe, particularly Scandinavia and Germany, but Dead Letters signified the band's major break-through. The album received 8 Gold and 6 Platinum music certification awards. Lead single "In the Shadows" received 6 gold and 2 platinum awards, selling over 1 million copies and breaking the record for performance royalties received abroad on a Finnish composition. Dead Letters had sold around 2 million copies as of December 2004, including 130,000 in the US alone, and is currently their biggest selling album to date. Jean Sibelius, born Johan Julius Christian Sibelius, was a Finnish composer and violinist of the late Romantic and early-modern periods. He is widely recognized as his country's greatest composer and, through his music, is often credited with having helped Finland to develop a national identity during its struggle for independence from Russia. The 2003 MTV Europe Music Awards were held at Ocean Terminal, Edinburgh, Scotland. The Emma-gaala is a Finnish music gala arranged yearly by Musiikkituottajat – IFPI Finland, awarding the Emma Muuvi or Emma Awards to the most distinguished artists and music professionals of the year. It has been arranged annually since 1983, except between 1988 and 1990. The Rasmus continued their extensive touring throughout 2007. The band met Desmond Child in Dominican Republic, who began working with the band on producing their seventh studio album. 2007 also marked the start of Eero Heinonen's career as a music video director. On 28 November 2009 they released their second compilation album, Best of 2001–2009 , featuring songs recorded between 2001 and 2009. While most of the songs were already released, it features a new unreleased song called "October & April" which features vocals by Anette Olzon. This song was recorded during the same time as Black Roses, but wasn't included as it didn't follow the album concept. In September and October 2016, the Rasmus posted updates from the studio showing them recording a ninth studio album, Dark Matters, was released on October 6, 2017. The first single from the album, "Paradise", was released on March 31, 2017. On the August the 17th 2018 it was announced via the official Facebook page that a new single will be released titled 'Holy Grail' on September the 14th. The Rasmus have released a total of twenty music videos. Niklas Fronda and Fredrik Löfberg of Baranga Film have directed three of the band's videos, all from the Dead Letters album. Dead Letters is the album with most music videos: seven videos have been released from that album, including three versions of "In the Shadows". The videos of "Immortal" and "Your Forgiveness" were directed by bassist Eero Heinonen. The first video they ever made was for "Funky Jam" in 1996. "Sail Away" is a song by the Finnish rock band The Rasmus, originally released on the band's sixth studio album Hide from the Sun on September 2, 2005. The song was written by the lead singer Lauri Ylönen. Sail away was 2nd on the United States singles list in 2005. Live Letters is a live DVD by the Finnish rock band The Rasmus, originally released on November 22, 2004 on Playground Music. ↑ Jeffries, David. "The Rasmus". Allmusic . Retrieved 7 August 2015. ↑ "Live Review: The Rasmus – O2 Academy, Islington – 21/05/12". Hit the Floor. 22 May 2012. Retrieved 7 August 2015. ↑ Deming, Mark. "The Rasmus - Best of the Rasmus: 2001-2009". Allmusic . Retrieved 7 August 2015. ↑ Simpson, Dave (6 April 2004). "The Rasmus". The Guardian . Retrieved 7 August 2015. ↑ Champ, Hamish (June 2003). "European Review". Billboard . 115 (26): 20. ↑ Main source of the band's history: Åsa Werner and Mia Lindqvist. "The Rasmus history". Rednora.com. Archived from the original on 2016-03-03. 1 2 3 4 5 6 7 8 9 10 11 "The Rasmus". The Rasmus. Archived from the original on 2012-04-22. Retrieved 2012-04-23. ↑ "Etusivu". Dynastyhelsinki.fi. Retrieved 2012-04-23. 1 2 "The Rasmus Hellofasite - new website online soon!". www.therasmus-hellofasite.it. Archived from the original on 15 May 2010. Retrieved 13 August 2017. 1 2 "Rock piece by The Rasmus overtakes Sibelius in foreign music royalties". Archived from the original on 25 February 2014. Retrieved 13 August 2017. ↑ "Polish Gala performance". The Rasmus Hellofasite. Archived from the original on 2014-02-21. Retrieved 2012-12-24. ↑ "News Retrieved on October 2, 2008". Archived from the original on 20 February 2012. Retrieved 13 August 2017. ↑ "NEWS – The Rasmus provides the official competition song for European Athletics Championships 2012". Therasmusofficial.tumblr.com. Archived from the original on 2012-12-10. Retrieved 2012-04-23. ↑ "Lauri Ylönen » Profile". Laurimusic.com. Retrieved 2012-04-23. ↑ Toimittaja: Airi Saastamoinen (2012-01-16). "The Rasmuksen odotetun uuden singlen maailman ensiesitys UMK:n finaalissa | Satumaa | Finaali 2012 | yle.fi". Satumaa. Archived from the original on 2012-04-19. Retrieved 2012-04-23. ↑ "New The Rasmus video". Sputnikmusic. 2012-04-18. Retrieved 2012-12-24. ↑ "Mysteria and a new edition of The Rasmus-album". The Rasmus Hellofasite. Archived from the original on 2014-03-28. Retrieved 2012-12-24. ↑ "Juttuarkisto - Aamulehti". Aamulehti (in Finnish). Archived from the original on 2015-10-06. Retrieved 2016-10-25. ↑ "The Rasmus" . Retrieved 2016-10-21. ↑ "Official Biography". Archived from the original on 20 February 2012. Retrieved 13 August 2017. ↑ "The Rasmus Hellofasite - new website online soon!". www.therasmus-hellofasite.it. Archived from the original on 6 June 2009. Retrieved 13 August 2017. Wikimedia Commons has media related to The Rasmus .